The US and the UK have accused the Syrian government and its Russian allies of fabricating a story accusing rebel fighters of a chemical attack. The US state department said the purpose was to "undermine confidence" in the ceasefire in Idlib province. Syria and Russia said shells carrying chlorine gas injured about 100 people in the government-held city of Aleppo last month. State media showed images of residents being treated in hospital. Russia later carried out air strikes against the rebels it accused of the attack. At the time, rebel groups denied carrying out a chemical strike and said the claims were a pretext for an attack on opposition-held areas. On Friday, the US said it had "credible information" that the story was false and that Russian and Syrian forces had instead fired tear gas. "The United States is deeply concerned that pro-regime officials have maintained control of the attack site in its immediate aftermath, allowing them to potentially fabricate samples and contaminate the site before a proper investigation of it by the Organization for the Prohibition of Chemical Weapons," state department spokesman Robert Palladino said. "We caution Russia and the regime against tampering with the suspected attack site and urge them to secure the safety of impartial, independent inspectors so that those responsible can be held accountable." Parts of the Aleppo region, as well as the neighbouring provinces of Hama and Idlib, are controlled by Turkish-backed rebels and jihadists. Britain's Foreign Office said it had "seen nothing to support the claims" made by Russia and Syria. "The UK assesses it highly unlikely that chlorine was used in this incident, as the regime and its Russian allies have claimed. It is highly unlikely that the opposition was responsible," a statement said. "It is likely that this was either a staged incident intended to frame the opposition, or an operation which went wrong and from which Russia and the regime sought to take advantage." 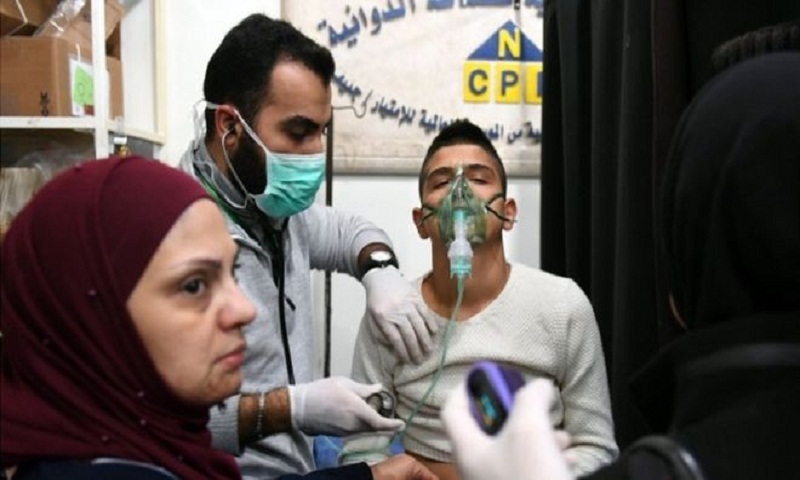 The Syrian Observatory for Human Rights, a UK-based group that monitors the war via a network of activists on the ground, said that about 100 people had been treated for breathing difficulties following a strike on western parts of Aleppo on 24 November. Western powers and the UN have accused government forces of using chemical and nerve agents on numerous occasions since the start of the civil war.